Looking to move to the Beach Borough Area? It is an exciting place to live in the resort area. Here are the Beach Borough homes for sale! The Beach Borough neighborhood is wildly varied in home prices. The area is basically where Interstate 264 runs into the Atlantic Ocean and therefore quick access to the Interstate. It is walking distance to the beach and all sorts of fantastic festivals! Restaurants and nightlife are everywhere. It is slightly northeast of the Oceana Naval Air Station. It is served by Frank W. Cox High School. 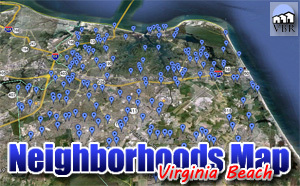 Nearby neighborhoods are North End, Shadowlawn, Croatan, Birdneck. We have a page with all the homes for sale in Beach Borough. Click on this button to see everything currently listed there. When you find a home you would like to see, please let me know! Call (757)589-1237 and I will arrange a showing! Or, on the property, complete the Find Out More form and click submit. I will get information to you right away!